The method of programming outlined in this book represents a major contribution to the growing body of literature in programmed learning. It is the first book in the field to present a carefully designed, complete and integrated system for analyzing, organizing and structuring learning materials in programmed form.Application of the system is illustrated through the step-by-step construction of two short programs. Starting with the analysis of the syllabus and course content, the authors take the reader through each phase of the programming process gathering and organizing the content material, construction of the program matrix and flow diagram and finally, the writing of frames.Every teacher and trainer can benefit from the application of this method to lesson plan preparation and to classroom teaching techniques. Such a method is essential, for all those who are writing programmed materials. In a new computer age classroom environment, programmed learning can be especially beneficial.C. A. Thomas, I. K. Davies, D. Openshaw, and J. B. Bird are instructors or directors at the British Royal Air Force School of Education. They are pioneers in the application of programmed learning in Britain and are highly regarded as forward looking and creative educational research workers. 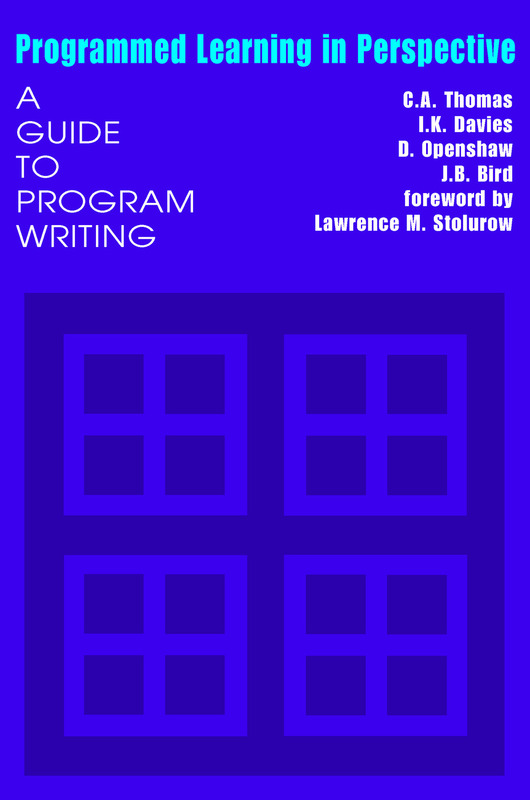 Their accomplishments include, in addition to this ingenious book, the design and development of the Empirical Tutor, one of Britain's major teaching machines, and the publication of a number of technical papers in the field of programmed learning.Lawrence M. Stolurow is professor emeritus of psychological & quantitative foundations at the University of Iowa.